Forgetting to grab a pre-workout snack before, say, a Zumba class or a three-mile run isn’t ideal, but chances are you’ll be able to push through, even if you’re a little drained (and hungry!) at the end. But when it comes to endurance sports and the training that goes along with them, proper food as fuel isn’t a benefit — it’s a necessity. But that doesn’t mean triathletes and other endurance athletes can just eat whatever they want since they’re burning so many calories. (Okay — some seem to be able to, I guess. But for most of us? Nope.) It’s not just a matter of getting the right number of calories — you also really, really need good nutrition within those calories. And while lots of endurance athletes can rattle off their VO2 max and 100m splits and all five of their heart rate zones without batting an eye, not all of them are as well-versed in how to eat well for their sport while achieving or maintaining the lean body type that’s ideal in these types of sports. 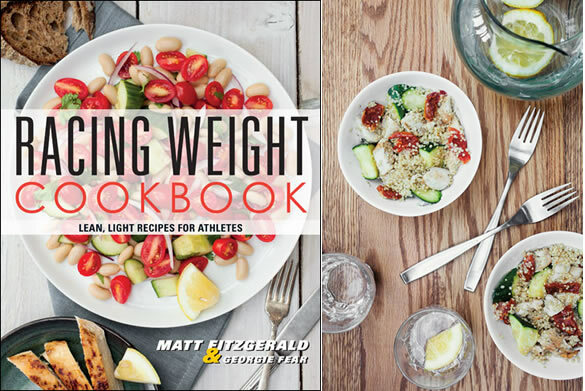 That’s where the Racing Weight series and, specifically, the Racing Weight Cookbook by Matt Fitzgerald and Georgie Fear come in. The series, which I’ve discussed a bit in the past on FBG, focuses on incorporating high-quality foods based on an easy-to-understand point system designed to help athletes become lean and strong and healthy, all of which I dig. So, when they offered up the new cookbook to review, I was psyched. And when I opened it up and looked through the recipes, I was even more excited. The raddest thing about the Racing Weight Cookbook is that it’s WAY more than just a cookbook. It begins with a really informative intro detailing the program (so, if you haven’t read Racing Weight, you should still be able to understand the point system), and from there is broken into three ingenious sections: one for athletes who don’t cook, one for athletes who have some cooking experience, and another for athletes who love cooking. Why don’t all cookbooks do this? It’s brilliant. Anyway, some of the recipes for folks who really don’t cook are barely recipes (like the yogurt recipe above, or toast with nut butter and banana), but what’s great about including those items is that, for someone who wants proper nutrition but is all, “You mean I have to cook ALL my meals? All the time?” — and we’ve all known those people; in fact, at one point, I was those people — these kinds of super-simple recipes give them an idea for totally easy items that still fit the nutritional bill. However, even if you strongly identify with one section, there’s still plenty for you in the other sections. There are recipes in the “Love to Cook” section that a newbie could certainly tackle, and I found a few recipes in the “Doesn’t Cook” section that I drooled over. It’s a great reminder that food doesn’t have to be terribly complex in order to be good, both in terms of taste and healthfulness. In addition to the recipes (and there are more than 100! ), there are also suggestions in each section for how to make certain staples in a variety of ways — think eggs and brown rice. To give you a taste (See what I did there? Taste?) of the cookbook, I’ve included a sample recipe below. Think you might want to give this book a go? You can find it in many bike, tri and running shops, or online. Sometimes a complicated meal just isn’t going to happen. 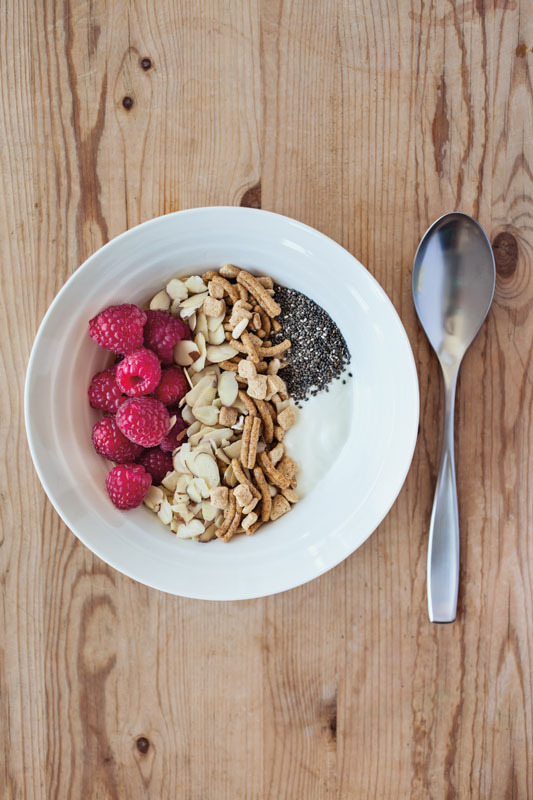 This is one of my common post-workout meals, a perfect fit for those times when I want some high-quality carbohydrates and protein without a lot of fuss. If you have leftovers, it also makes a great lunch. 1. Bring water to a boil in a medium saucepan over high heat. Add quinoa, bouillon, and garlic and return to a boil. 2. Cover, reduce heat to low, and set timer for 20 minutes. After 10 minutes have gone by, stir in chicken, zucchini, sun-dried tomatoes, and basil and cover again. 3. With 2 minutes remaining, remove lid and stir again. Leave pot uncovered to allow any remaining water to evaporate. Scoop into bowls and enjoy. Republished with permission of VeloPress from Racing Weight Cookbook. Try more recipes at www.racingweightcookbook.com. As an endurance runner myself, this sounds right up my alley! I’d probably go to the intermediate section first, since I cook often but am by no means the best chef in the world. 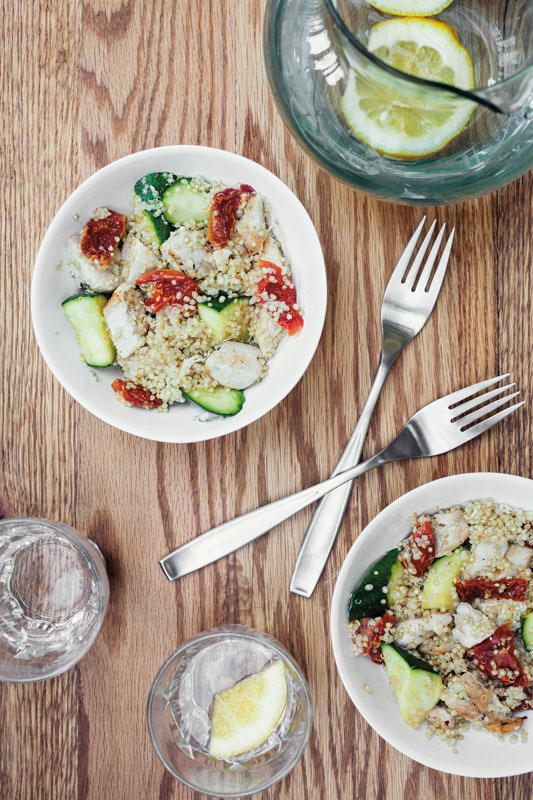 The quinoa dish looks delicious – I make similar dishes all the time, and toss in a bunch of greens to wilt at the end, as well! I just bought this cookbook! I made the crockpot primavera sauce, and I’m about to make some of the flatbread pizzas. I love the concept of this cookbook! When I have time, I’m OK with advanced, but I also like having the easy section for when I don’t have a lot of time to devote to the kitchen.